Jackson Dollinger Photos, News, and Videos | Just Jared Jr.
You’re going to L-O-V-E Sydney To The Max‘s Jackson Dollinger! 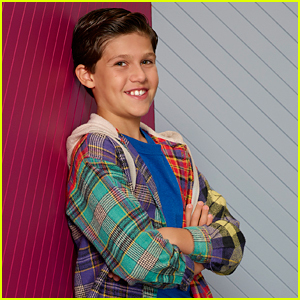 The 12-year-old actor chatted with JustJaredJr.com about his new series, where he plays a young Max. Jackson also spoke to us about how cool it would be to have a moment in the show where his young Max could meet his future daughter, Sydney. In the series, Jackson and his pal Leo, are always finding themselves in a lot of the same predicaments as Sydney does and there was one scene in particular that Jackson says was the weirdest. Sydney To The Max premieres Friday, January 25th on Disney Channel. Ruth Righi, Ava Kolker, Sophie Pollono and Sofia Rosinsky all gather up for a cute group shot during a special screening for their new Disney Channel shows in Los Angeles this week. The four actresses were joined by Ian Reed Kesler, Caroline Rhea, Jackson Dollinger, Christian J. Simon, Brandon Rossel, and Winslow Fegley as they surprised the local Los Angeles Boys and Girls Clubs with a first look at Sydney To The Max and Fast Layne. Sydney To The Max, premiering NEXT Friday, January 25th, centers on Sydney Reynolds (Righi), her single dad Max (Kesler) and her hip and sassy grandmother Judy (Rhea), as they navigate the challenges of growing up. She series features flashback scenes to the 1990s to a young Max (Dollinger) and his best friend Leo (Simon) parallel the funny predicaments invented by Sydney and her vivacious friend Olive (Kolker), showing that the ups and downs of being a teenager never really changes. Fast Layne is set to premiere on Friday, February 15th. The series centers on twelve-year-old over-achiever Layne (Pollono), who finds her orderly life thrown into a tailspin when she discovers a sophisticated talking car named “Vin” hidden in an abandoned shed. With the help of her eccentric neighbor Zora (Rosinsky), Layne embarks on a high-speed adventure filled with secret agents and other surprises as the girls set out to unlock the mystery behind VIN’s creation. Sadie Stanley looks like royalty as she arrives at the premiere of Mary Poppins Returns held at the Dolby Theatre on Thursday night (November 29) in Hollywood. The Kim Possible starlet was joined by her co-stars of the future DCOM, Ciara Wilson and Sean Giambrone. Sydney To The Max stars Ruth Righi, Ava Kolker, Jackson Dollinger and Christian J. Simon were also seen at their first premiere together.